This recipe is for my mother! It’s her birthday and she LOVES gazpacho. Chilled Spanish-style tomato soup – perfect for hot weather. 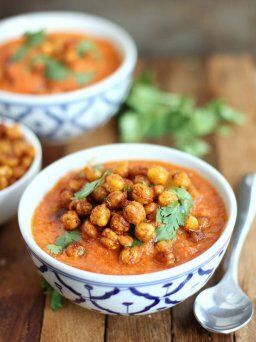 Top it with avocado, sour cream, or those Pan-Fried Crispy Chickpeas (recipe linked below) for a light lunch or dinner. I love packing leftovers for lunch! Combine the tomatoes, cucumber, red pepper, bread, garlic, olive oil, red wine vinegar, and crushed red pepper in a blender. Blend until nearly smooth. Add water if the soup seems thick. Taste and add salt and pepper, as desired. Refrigerate until ready to serve. Top with any of the recommendations above or set all of them out so that people can customize their bowl!